Grad Students & Valentine’s Day…! This past Monday was that time of the year where lovers stress out to prepare gifts and plan special events – for days or even weeks, might I add – for their special person(s?). February sneaks up on you before you have even made up your mind about your new year’s resolutions, and suddenly there are heart-shaped edibles and every shades of pink galore across the city. The campus — the beautiful 993 acres of land occupied by more bachelors/bachelorettes in their late teens to late 20’s than married couples — is not an exception. However, such demographics (on-campus and within the department) makes romantic matters, such as Valentine’s day, difficult for a graduate student. Old enough to have been happily married to someone, but too young to have gone through a divorce. Young enough to still look around for more options, yet old enough to plan ahead for a happier future with Mr or Miss Right. Perhaps a bit too young to have a child, yet more than physically capable of having and raising a child (scary!). So figuring out where you fit in the Venn diagram is already harder for us grad students than those who are not in the overlapping region of the diagram. One day you might come home from the lab and realize that it’s too empty (despite the loud presence of your roommates, if you have any) and that you’d like to find someone for a long-term. If you have someone beside you, then you might be thinking ‘Should I really be serious about continuing this one? Is this person THE one?’. The next day, you might wake up and think ‘Geez, that was a stupid idea, I want to have fun, stay young! I’ve got my career to worry about. None of this romance nonsense!’ Regardless of which of the two days you might be having, the truth seems to be this – it’s hard to meet new people when you’re focusing on your research. Second, and more importantly, your charm and charismatic character from undergrad or high school may no longer be as sharp as you think it is. For example, after having dissected, analysed, hugged and kissed the topic of hesitation gestures for human-robot interaction (my thesis topic), everything around me revolved around that topic. When I see someone reaching for something and suddenly halts (i.e., hesitates) or even use the word ‘hesitation‘ in any sentence and in any contexts, I suddenly become overly excited and hyper. And before I know it, I am talking about my data analysis techniques, fitting splines through the hesitation motions I’ve captured, and how far I am in the project etc., etc. Highly uncontrollable behaviour on my part and probably highly unattractive to someone I’ve just met, even to those who are seemingly as nerdy and scientifically-minded as me. So if you’ve got someone who happily tolerates the awkwardly-skewed charm of yours, I would strongly suggest you hold on to him/her — he/she’s got something that seems pretty rare out there in the real world. Some of my graduate student friends spent the Valentines day by themselves — perhaps popping a bottle of wine alone in their residence, watching a chick-flick with the company of unhealthy yet tasty assortment of snacks. Those who have someone spent the day unwrapping a small surprise or two they’ve prepared – even with their special someone living overseas. And many singles — who totally didn’t see the Valentine’s day sneak up upon them since there’s nothing to plan or prepare for, and are ever so slightly happy that they have been spared of the painful gift purchasing and event planning process — found comfort in spending a single’s night-out (or night-in) with the company of good friends. This entry was posted in Love Life of the Nerds, UBC Grads 101 on February 16, 2011 by AJung. I hope everbody’s having a nice reading break. But I doubt if people are into studies today. It has been drizzling and raining continuously; something I wouldn’t wish for on Valentine’s Day, but with the weather getting colder, I am lost in explosive reminiscence. The memory of having a very special company, in front of a fireplace inside a house, with sweet slow music playing, with incense burning, with only the fire illuminating the whole place making the chandeliers on the ceiling glitter like diamonds, with a similar chilly and rainy weather outside. I am drowning in an ocean of nostalgia :). Okay then, let me swim back to the present. I will take an opportunity to speak about my experiences I had this weekend. Friday started with intervewing a few undergraduate students (for assisting me in my research during summer), along with my supervisor Dr Sheldon Green and colleague Haiya Peng. Then I dealt with classes and assignments for the rest of the day until around four, when I thought it was time for some coffee but when I went to Tim Hortons, I had a chance meeting with a friend named Vasu Tiwary, a very jovial and enthusiastic person, apart from being a graduate student in the Department of Mathematics, UBC. I had a ‘valuable’ conversation with him, about life and about novels, something I usually miss to have. Then I went to the Birdcoop gym for a little workout and when I left for home I was extremely fatigued. I had to return back to UBC by eight to attend my tango class at REC. The tango class in the REC studio has been an exciting experience this term. When I speak about tango to some people, I get an impression that they consider the dance to be a simple one with a male and a female dancer holding hands and walking and circling the dance floor in a trivial sync, but I believe the dance is a very sophisticated one, which requires a lot of practice to learn it well. I also feel that it is a dance with an elegance of its own. The more the passion, the more the flair of execution of this dance. When I returned home, I had a small gathering with Javier and Manuel, my Spanish and Mexican roommates. We had a few drinks before going to sleep. I was really tired after the long day. But I think something remained to happen. At around 4 am, I suddenly woke up and realized someone was playing music with high bass in the room underneath mine. After enduring it for around half an hour it wasn’t anymore bearable, so I went and requested the guy to reduce the volume. After a low volume for around 10 minutes, I found the music volume had been raised again and so I went again and this time, with a slightly hard tone, asked the person to reduce the volume for I was not able to sleep. And the same thing happened again. Then, I was running out of patience and due to all the fatigue from the previous day, I was turning paranoid. At around 5 am, I dialled the house owner’s number but my call wasn’t answered. Then I had no option but one. I called 911 and then my my call was forwarded to Vancouver Police, who then gave me a non-emergency number and asked me to call immediately. Getting the police involved only for someone playing loud music may seem unnecessary to some people but to all those people I say that, had you been in that situation and seen the person’s attitude, you would have done the same. I called the non-emergency phone number and said about this person who was not cooperating and was probably taking drugs, and in around 25 minutes, two large Vancouver Police vehicles pulled over in front of my residence. I was called and asked to open the front door, which I did and then, directed the 3 cops who came in, to the door of the annoying person. The person was interrogated for around half an hour and since I was listening from a distant place, it seemed to me that the cops even found some objectionable thing in his room (I shall not go into much detail here). The person was given a warning and they said, this time he wasn’t arrested. Well, I had a problem and I dealt with it. Rest of Saturday wasn’t so exciting so I will switch to Sunday. I had not been to a church for a long long time and it was really great to have an invitation to a church from Peter Anderson, a graduate student under the supervsion of Dr Green pursuing his PhD. I donot remember the name but the church is located close to Dunbar. It is a Baptist church and when we were there, songs were performed and we all sang. It was a very holy and spiritful atmosphere inside the church. After the songs, people prayed. There was prayer for children who were born recently and for mothers who were going to deliver soon. There was prayer for the people of Egypt. After the prayers, the pastor of the church spoke about the history of churches in different parts of the world. After the final prayer, we went to have a potluck meal which was arranged that day. One very nice thing I noticed was that everybody knew almost everyone else and it kind of felt like home. Everybody was introducing oneself without hesitation and it really felt so good to be there. I am thankful to Peter for inviting me as I had a very special time at the church. This entry was posted in Uncategorized on February 14, 2011 by anupamb. I hope you had a great weekend! This week is our reading week/spring break/week off, so I celebrated by doing absolutely no work this weekend, and it was amazing! Back in December I bought one of those “daily deals” (I think it was from ‘Living Social’) for a snowshoe / fondue trip, and went on it yesterday. One thing that is great about Vancouver is we hardly ever get any snow in the city, but you go half an hour away to any of the mountains, and there is tons of the stuff. So we still get to play in it, but don’t have to deal with it on a daily basis. Anyway, the trip was a lot of fun. It was pretty slow paced, and most of the people were quite a bit older than we were, but it made me want to get some snowshoes and go on some trips of my own! Our trip was through Natural Trekking which is owned by an outdoorsy Vancouver lady. She runs the tours herself, and does all kind of them all over the world. 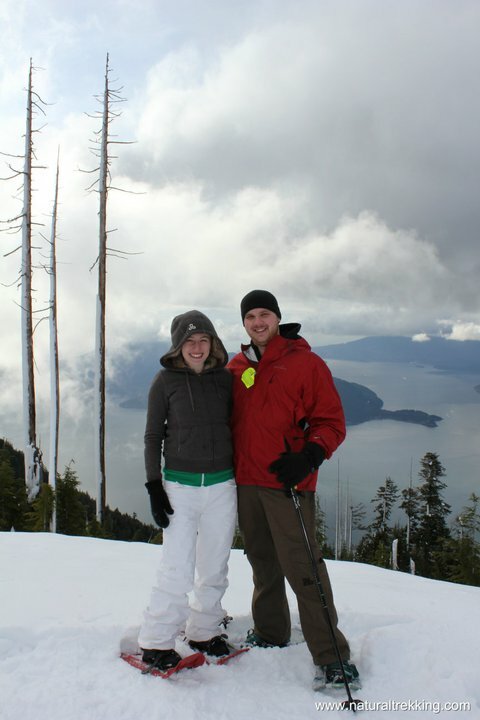 Our tour was at Cypress and we snowshoed up to a lookout point where we could see the Bowen Island and the Sunshine Coast. Here you can see a group picture at the base of the mountain. Cypress was one of the Olympic venues last year where I believe they hosted free-style skiing and snowboarding. 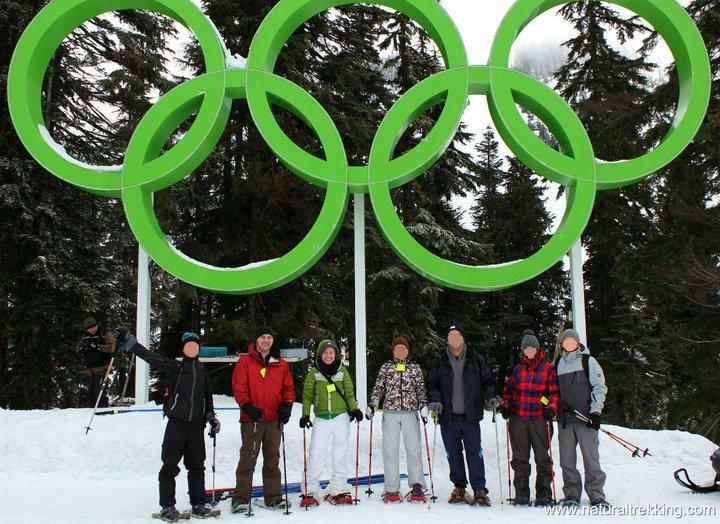 It was actually a little sad, it was so warm during the Olympics they had to airlift snow to Cypress from other parts of the province, and I heard they had to use dry ice to keep it from melting! The olympic rings are still there. We were lucky, the weather was absolutely miserable in the morning, and it had been raining on the mountain all day the day before. Then there was a bit of a snowstorm in the morning, but by the time we got there the sun was even out for parts of it, and the snow was light and fluffy from the storm! I wish I had taken a picture of the view at the top, but if you look around us, you can see part of it. It was so pretty and we had the fondue there. But now its back to the office. I seem to be the only one keen enough to come in this early during the break, and the lights in our office are on a timer that shuts them off if the front door isn’t opened every 30 minutes or so, and its already getting pretty annoying. GRR! AND THEY SERIOUSLY JUST SHUT OFF NOW AS I WROTE THAT! I wonder if I could tie a string to the handle and open the door from my desk … anyway, enough grumbling. This entry was posted in All about Vancouver, Events & Fun on February 14, 2011 by kwiens.